Who’s Paying Peter Daou to Smear Bernie Sanders and the Left? Peter Daou advised several failed campaigns, directing their online outreach and rapid response. Daou also works as a paid consultant for many corporations and establishment organizations. You guessed it: Daou, of course, also worked for the Clinton Global Initiative. Considering how busy the life of such a high-profile consultant must be, it is very interesting to see how much of his time Daou actually spends tweeting about Bernie Sanders, the so-called “Bernie Bros”, and about “the anti-Hillary left”. During a period of seven days (from 07/31 until 08/07) alone, Daou tweeted 29 times about Sanders, each tweet highly negative of the Senator. In this tweet from Aug 3, 2017 Daou explicitly claims that Bernie Sanders is a “toxic, destructive influence”. Daou also claims that Bernie Sanders voted for the interests of the NRA because the NRA spent money for his election. During the same week, Daou tweeted less about the actual POTUS, Donald Trump: only 20 times. However, if you take a closer look at Daou’s Trump tweets, it is clear that Daou does not spend much of his time criticizing Trump, but actually mentions the Orange POTUS in order to continue with his attacks on Bernie Sanders. Trump is only mentioned by Daou to insinuate that the left isn’t actually fighting against Trump. Daou usually mentions Trump to lower the bar of what he thinks would be acceptable discussions about the Democrats. Furthermore, Daou spent a lot of his Twitter time during this period to criticize “the Left”, usually by claiming that the Left is attacking the Democrats and that those attacks are “gratuitous”, full of rage and hate, and that the leftists are trolls and bots who are making “virulent and threatening comments”. 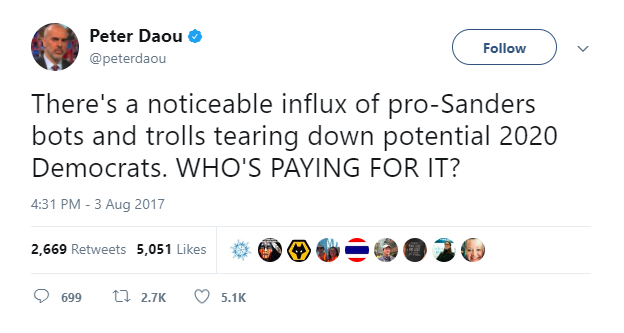 As with his attacks on Sanders, Daou usually assumes a defensive position (“I am defending Hillary Clinton/Kamala Harris from the anti-Hillary/anti-Kamala Left” or “I am defending the Democrats from the leftist bots using GOP talking points”) even though he never provides any evidence for these leftist attacks. His audience almost never sees who these “leftist bots” and “Bernie Bros” really are. Daou’s followers almost never see what the actual “attack” was. Furthermore, Daou uses the pretense of defending someone to actually proactively smear the left. Daou’s defending us all from the leftist haters by insinuating they have an interest in knocking down the Democratic 2020 contenders. Daou is not shying away from starting or spreading baseless conspiracies about the left. Daou’s commitment to attacking Bernie Sanders must require a lot of his valuable consultant time and definitely goes beyond simply not agreeing with a certain politician. So, are we to believe Daou is doing this because he seriously opposes the policies proposed by Bernie Sanders? If this would be true, we would see some effort in Daou’s tweets to actually engage on specific points of those policy proposals or even Bernie Sanders’ views. But no, Daou is not expressing his opposition to Medicare-For-All, he’s not arguing how raising the minimum wage is wrong, or how we should not invest in improving our infrastructure or in green energy. Daou didn’t have a single tweet about Medicare during this week. Daou remains very silent on climate change. Not a single Daou tweet about the wages. Hence, it looks like Daou is just doing what he as a Beltway consultant always did for money — creating and spreading potentially harmful narratives about his clients’ opponents. The question is: who’s paying for it?